Gathering around the table as a family on Thanksgiving is all about being grateful for the time you have to spend together. 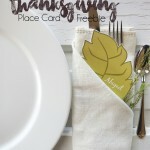 Setting that table should reflect that celebratory vibe, but it shouldn’t take a ton of time… which is why we wanted you to have our free Fall Leaf Free Printable Place Card download! 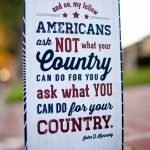 patriotic subway art free friday download! No not those lucky charms! We’re talking printables baby… what else right? 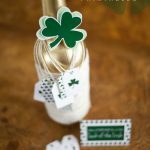 Get your Friday freebie and make your very own St. Patrick’s Lucky Stout bottle with our lucky charms printable tags! It’s that time of the month again! For freebies… duh. Each first Friday of the month we are giving out a free printable item. 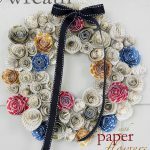 This month, we have a Paper Flower Wreath template to kick off fall! Freebie includes patterned paper template and how-to instructions.